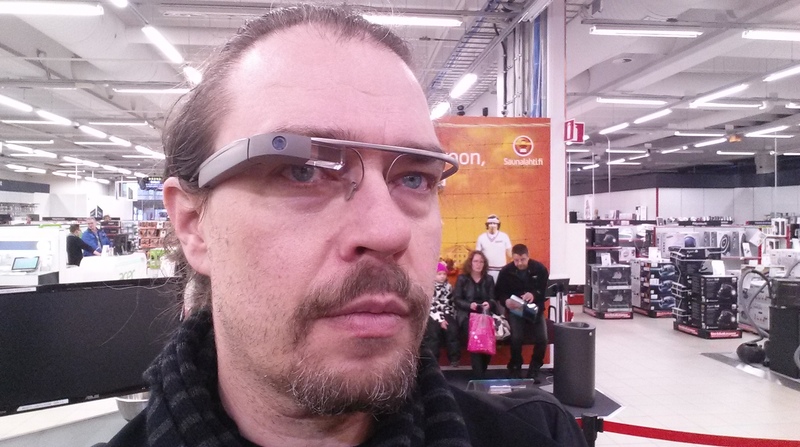 Today I had a chance to do a very quick test of Google Glass in local PC/tech store. The situation was hardly optimal for any real user testing, but at least this was a possibility to try on this coveted/hated device. Despite its largish frame, the eyewear is actually rather light and easy to carry. The screen (when you finally get it in your field of vision, it requires some adjustment first) is bright and sharp enough and seems to float up there, few virtual meters away. My main frustration was with the voice control: I kept on repeating “Ok Glass”, but at least this model requires that you first activate the specs through the touchpad in the right side, navigate into the correct menu mode, which displays the time of clock and the text “Ok Glass”, and it is only after this when you can give voice commands (e.g. “take photo”, “record video”, “google University of Tampere” – which actually produced wikipedia entry for “University of Tampa” – close enough…) This is not good, and I hope this was only a feature of some out-of-date firmware (?) Otherwise, I cannot see it as very convenient to use your hand to flip through the menus (displayed in a tiny, semi-transparent floating screen) in order to get into mode where you can “naturally” enter commands. Also, the voice output from Glass was at such low level that it was almost impossible to hear anything at the noisy store environment. Ok, Glass. Interesting, but we will have a closer look again at some future event. The main lesson from Google Glass is perhaps that hardware actually does not matter so much any more: design matters, and effortless access to the service is a must. Technical specs of Glass are hardly mind-blowing, but if it manages to provide the seamless immediacy of Google’s search, calendar, translation and navigation services (for example – not to speak about mobile photography and lifelogging) to the corner of your eye, or to your ear, then it has managed to move us one step closer to the original visions of wearable computing.